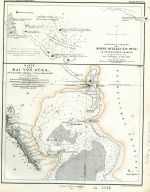 Title: Karte der Bai von Sues. Sub-Title: Nach der Engl. Aufnahme v. Comm. Mansell, 1856. Measurement Notes: Prime meridian Greenwich. We estimated the map coverage by drawing an hypothetical border with 1 degree from Suez (coordinates: 29.98 N, 32.61 E). Notes: Upper left corner "Petermann's Geographische Mittheilungen." Upper right of map "Tafel 15." On top of the page, there is a small map titled "Original-Skizze der Moses-Quellen (Ain Musa) im petraischen Arabien."